A careful freshening up lets all the glory of a fine old Shingle-style house on the North Shore shine through. Grand inside and out, this stately 1885 former summer home in Manchester-by-the-Sea, Massachusetts, retains its historic charm. The foyer’s original woodwork soars to the third floor. 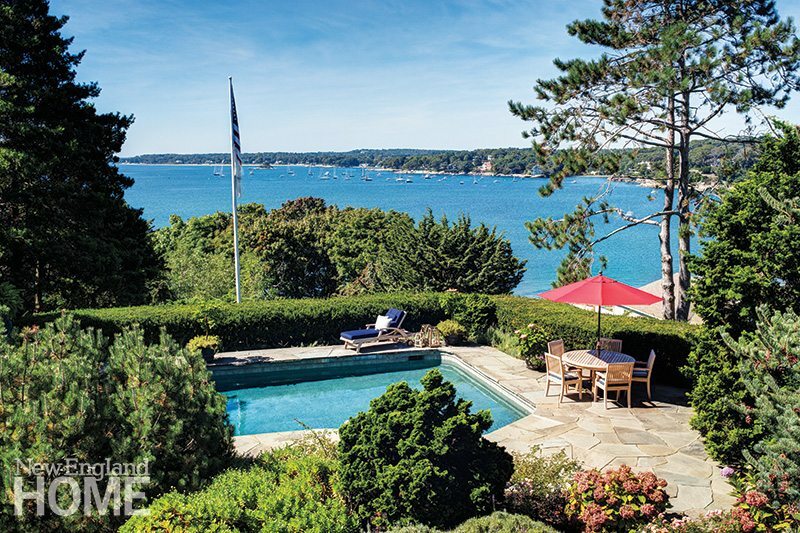 Owner Tom Trkla fell for the classic Shingle-style house perched high atop a hill. A work by Joan Miró hangs above the foyer’s original brick fireplace. Kelly Dukarski’s landscape design surrounds the pool with hedges that afford privacy without blocking the views. Designer Honey Collins opted for casual, but not outdoorsy, furnishings for the sun porch because the space is open to the living room. The living room’s herringbone wallpaper lends a masculine touch, while a botanical rug adds a hint of femininity. The second-floor landing doubles as a cozy spot for enjoying a good book. Punches of red brighten the master suite. A variety of patterns-from herringbone to stripes to circles-mix it up against the dark walls of the music room. Anyone who has ever driven the winding Route 127 along the North Shore of Massachusetts knows the pleasure of slowing to a crawl to take in the beauty of the homes, which are as lovely as the stretches of ocean that intermittently burst into view like paintings of classic seascapes. What’s left of the grand summer houses of the late 1800s along this stretch of road still serve as standard-bearers of Shingle-style architecture. Vast lawns that tumble down to the water’s edge hold the intricately detailed structures once built for well-heeled Bostonians seeking to escape the summer heat. To admire one from the outside is to have a lesson in the art of architectural detail. But to see one whose interior architecture remains much as it was 130 years ago is akin to spotting a creature long thought extinct. Tom Trkla had looked at a number of homes along the water from Marblehead to Gloucester, taking along a friend, architect Laine Jones, for advice. When he stepped inside this 1885 manse in Manchester-by-the-Sea, his reaction was immediate. “When we walked into this house and saw the woodwork, Laine said, ‘This is it,’” says Trkla, who was looking for a home that would entice his four grown children to visit often. Soaring above the heavy front door, the foyer rises like the entry to a castle. Carved paneling follows the staircase and supports a screen of turned woodwork with spindles stretching toward the third floor. A fireplace of red brick bids warm welcome. Well-tended by previous owners, the house needed only some updated electrical and audio systems and the skillful touch of a talented interior designer. Located at the highest spot on Smith’s Point, the house commands a nearly 360-degree view of the water, including a historic lighthouse. For all the expansive vistas, however, Collins felt the connection between the outside and the inside could be stronger. In less capable hands, creating that connection could have meant a Nantucket-blue-and-white-on-steroids theme, but Collins had something more subtle and sophisticated in mind. “I didn’t want it to be beachy, but more coastal,” she says. A simple striped dhurrie in a trio of creams and browns covers the floor of the sun porch, and roughed wood furniture gives the room a casual feel. For the dining room, which has paneled touches that echo the entry hall, Collins used a Phillip Jeffries burlap wallcovering with faux-nailhead accents. A light Oushak rug and dining chairs upholstered in a pale gray fabric with a small herringbone pattern keep the room from being too dark. “It worked to use something masculine on the walls paired with something lighter, more feminine on the floor,” Collins notes. Around the corner, in the music room, Collins turned to a rich Farrow & Ball paint color called Down Pipe for the walls of the small, very tall room. The herringbone pattern, a favorite motif of the designer’s, appears again in the Landry & Arcari rug, giving a rhythm to the space and contrasting with the circular pattern on the drapery panels. Up the foyer’s staircase, past the delicate watercolor portraits of Trkla’s children, lies the master bedroom with its vast view. “The view is a focal point here, so it couldn’t be a heavy room,” says Collins. Draperies in a light taupe hue frame the windows without obscuring the vistas, while another Phillip Jeffries covering adds subtle texture to the walls. Pillows with an ikat-patterned fabric sport touches of red for a bit of interest.